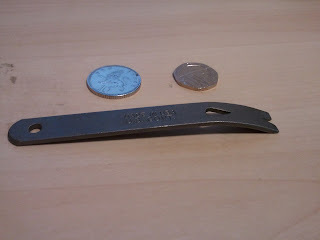 Just got a Pocket Widgy Pry Bar to go in my EDC and to use at work. Have to say I'm very impressed with it so far. It has excelled at the job I got it for, prying PSUs out of very old PC's. They are meant to be quick release and probably are if they weren't covered in 10 years of crud and dust. When Uncle Sam requested a small pocket pry bar for technicians to open ordinance crates in the field, we offered these as the solution. These compact bars are 4" x .5", heat treated D-9 steel and provide a common sense solution to broken knife blades and bent screw driver shafts. Coins are for an idea of scale. I got mine of e-bay as it was cheaper. I have wrapped mine in some cord so its a bit easier on the hands and so I have some handy cord if needed. 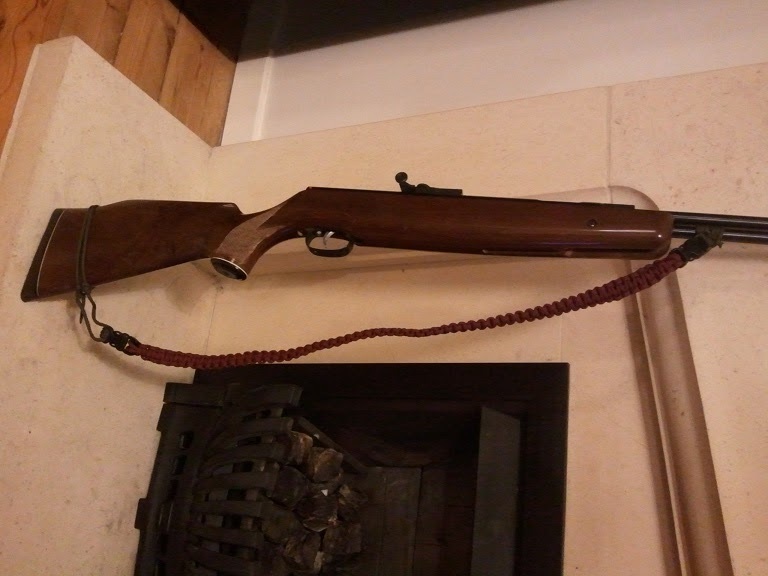 Not to sure what I would use it for in the woods but its fairly light and think it could come in useful. I have been thinking about getting a sling for my HW77 but I didn't really want to drill the stock to fix any swivels in to it. 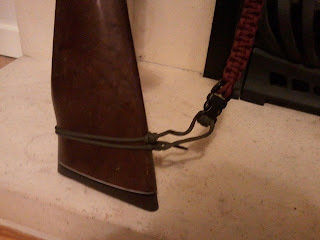 I had a load of paracord lying so I thought I could try and make a sling using the knots I have learned from my bushcraft skills. The knot on the under lever is actually a not a knot its a Prusik Hitch, it uses friction so it does not slide on the metal. This then has a paracord bracelet clip on it. I have used 2 Adjustable Loops on the stock, again with another bracelet clip on it. 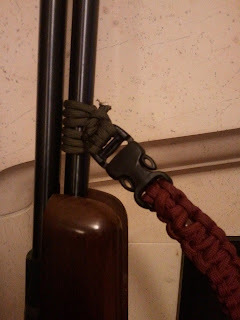 Then made basically a very large paracord bracelet which clips in to the 2 mounts on the gun. Nothing new here but I'm quite happy with it. Lowe Alpine Sting in Olive Drab - IMHO this is the best rucksack ever made, I find it really comfy even if it is a little heavy. I have the 2 side pockets as well which give me an extra 20 liters capacity. Hennessy Expedition Asym Classic - This is a great hammock and tarp in one. I have had it modded to have a full zip added around the bug net so I can have the best of both worlds with it, bottom and top opening. It also uses the quick set up technique using rap rings, got this idea from Trekkingnut. DD 3x3 Tarp - For a longer camp when more shelter would be required I use a DD Hammocks 3x3 tarp. 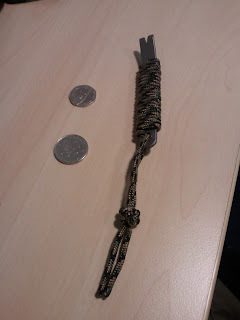 I have put in the bag with it 10m of para cord and with 2 Nite Ize Figure 9 which are used to tie up the cord quickly. Vango Viper 1000, British Army Arctic, British Army Jungle. In addition to the sleeping bag I use either a underquilt (like a sleeping bag but hangs outside the hammock) or a thermarest camping mat. Honey Stove - Nice little stove that packs down flat but it can be a bit fiddly to assemble and you do get a bit dirty from handling it. Exotac Nano Striker - My review in a previous post. Bic Lighter - Nothing else to say about this, we all know what it is. Zebra 10 cm billy - I have modded mine and revmoved the bail arm and replaced it with a section of bike brake cable. This allows it to hang better over the fire. Helikon Thermal Cup - Nice little thermal cup with a lid, this just fits inside the billy. Source 3L widepac - I don't normal have this full but figured its better to be able to carry more water if required then not. As I carry my water in I don't currently have any method to filter it. Mora Clipper - Cheap and cheerful bushcraft knife, cannot go wrong with one of these. Gransfor Bruks Small Forest Axe - Not to big and not to smal, just right. I don't always take this with me only If I know there is quite a bit of wood to to chop, other wise I make due with the Mora and Bahco. First Aid Kit - This kind of goes with out saying. Pretty standard kit, but have added a tick removal tool, paracetamol, ibuprofen and a compression bandage. The last one because if your using an axe and it goes wrong, it can go wrong in big way. Alpkit Gamma Head torch - Nice torch with high and low beams and also red and green light. Runs off 3 AAA batteries. UCO 9 Hour Candle Lantern - This adds a nice bit of light with out blinding you like a torch can. This list is not definitive and changes depending on where, when and how I'm going camping. I have not added food and drink as again this changes all the time. I've had my Hennessy Hammock for about a year now and love it, but I do miss the openness of the DD Frontline when used with the bug net underneath it. After looking on Hammock Forums I saw that people were getting there Hennesssy's moded by having a zip put in, all the way round the bug net. Posting my hammock to the USA was going to be to expensive so I kept looking and found UK Hammocks which did the mod and were UK based. After contacting Mat from UK Hammocks I sent him my hammock and a week later I now have a Hennessy with both the underneath opening and a full zip. Very happy with this but have yet to get out and try it yet. Weihrauch HW77k - The start of a new project. Just got a 2nd hand Weihrauch HW77k in .22. Its from 1987 so its not in bad condition for its age but I'm going to do a bit of work on it. Going to remove the old varnish on the stock, sand it down if needed and then maybe use Danish oil or similar on it to bring out the grain. The 2nd part will be to strip down the workings and give them a clean and maybe put a tuning kit on it if needed. This should a great little project.